The AVI series provides high amplitude (as high as 100 Volts) flat-topped pulses with rise times as low as 200 ps and fall times of 2 ns. The AVI-V family offers rise times of 350 ps, pulse widths variable from 2 to 100 ns, variable amplitudes to 50V, and pulse repetition frequencies up to 20 kHz. 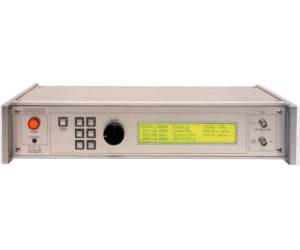 The higher-voltage AVI-V-HV2 family provides rise times of 500 ps, pulse widths variable from 4 to 100 ns, variable amplitudes of up to 100V, and pulse repetition frequencies of up to 5 kHz. The AVI-V-HV3 family is similar, but offers faster 200 ps rise time operation. Models with -C or -B suffixes include an internal oscillator, whose PRF is variable up to 100 kHz (40V models), 20 kHz (50V models), or 5 kHz (100V models) using the front-panel controls. (The minimum PRF is 4 decades below the maximum PRF). A delay control and a sync output are provided for oscilloscope triggering. All models can also be triggered externally with a TTL-level pulse, at any PRF between 0 Hz and the maximum rated value.